Albeit it will be close, but —if you believe the league’s media — then this season’s Tri-Valley Conference Ohio Division championship will come down to the regular-season finale. And, per those pundits, the home team that final Friday night will claim the conference crown after a two-year absence. That’s because, in a poll of seven media members which cover the TVC-Ohio, Athens has been picked to capture this year’s division football title — as the poll was conducted by the Ohio Valley Publishing sports department. The Bulldogs, last winners of the TVC-Ohio three years ago to cap off a four-year reign of division dominance, are predicted to defeat last season’s champion —the Nelsonville-York Buckeyes. In the final tallies, Athens amassed 46 points and Nelsonville-York 42, as the Bulldogs boasted four first-place votes while Nelsonville-York notched the other three. Vinton County collected 32 points to place third, while Meigs edged River Valley —26-25 — for fourth. Wellston with 18 points was sixth, as Alexander —winless in the TVC-Ohio a year ago — got seven points. Just two years ago, the Spartans went a perfect 7-0 in winning their first Ohio Division championship in program history. 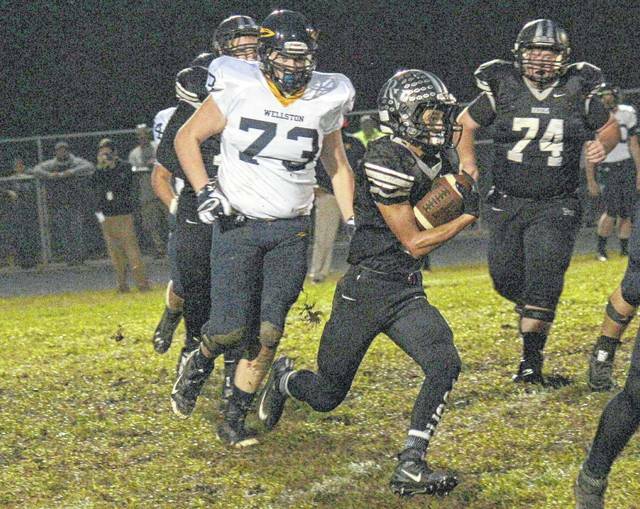 The Ohio Valley Publishing sports department had three votes in the poll, while two votes belonged to The Athens Messenger — and the other two to The Telegram. Last season, the Buckeyes won their first league championship since 2010 — going 7-0 and handing the Bulldogs their only loss in the final game. River Valley and Vinton County both went 3-3, while Meigs and Wellston both went 2-4. In addition to their four first-place votes, the Bulldogs were second on the other three. The Buckeyes were second on three ballots, but finished fifth on another —the same ballot of which Vinton County was voted second. The Vikings were third on four, and fifth on two others. Meigs, which last won the TVC-Ohio two full decades ago (1998), was fourth on four ballots —and also received a third, fifth and sixth. The River Valley Raiders ranged from third on one and sixth on another —finishing fourth in three votes and fifth on two more. Wellston had five sixth-place votes, but scored third on one and fourth on another. In the past two decades, Nelsonville-York has won outright titles in 1997, 2000, 2003, 2004, 2005, 2006, 2008 and 2010 — while sharing with Athens in 2009. Vinton County claimed its last league title in 1999, while Wellston won its only TVC titles in 2001 and 2002. Belpre, before leaving the Ohio Division in favor of the Hocking six years ago, won the division in 2007. Meigs entered the TVC in 1983, while River Valley is beginning its fourth academic year in the conference. River Valley’s Layne Fitch carries against Wellston during their Tri-Valley Conference Ohio Division football game last season.